A few years ago, my Mom typed up recipes of hers that I like (as well as some random ones, featuring both foods I don’t eat or dishes I’d never seen her cook or even heard about until the recipe appeared in its plastic sleeve). Yesterday, arriving on a red eye flight from Colombia, land of varied potatoes, I went looking in my glossy stack for the recipe for her delicious potato leek soup. It wasn’t there. When she called to say hello later in the day, I asked her why she hadn’t included this recipe, one of my favorites growing up, and was told in approximate seriousness that “you’d have to be an imbecile not to know how to cook something so simple.” Ah, maternal affection. 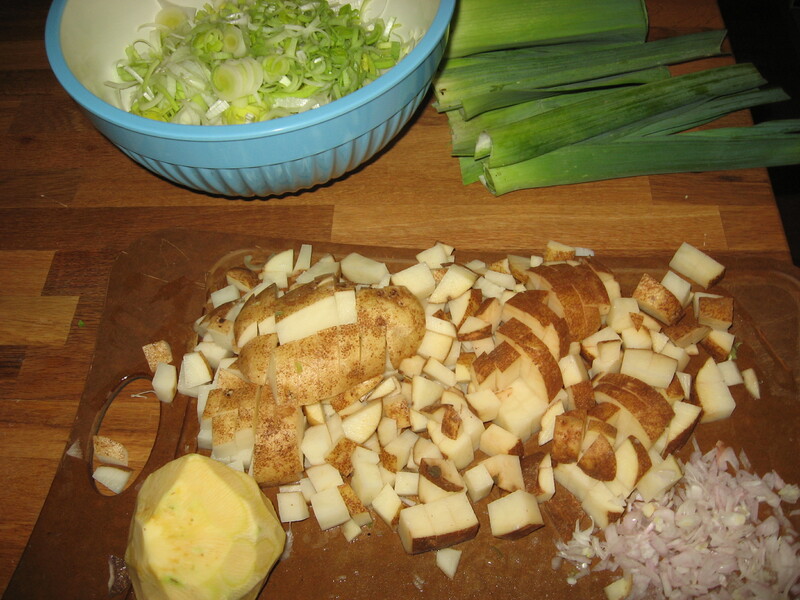 But she does have a point: it would be pretty hard to not manage to assemble a passable soup out of potatoes and leeks (assuming you know how to clean them and not end up with sandy soup). That said: When I cook, I can usually imagine how I would prepare a dish if forced to give it a shot without a recipe, but really do prefer speculation in context. I’m happy to modify a recipe, but like to see the theoretically BEST way to prepare something before just trying A way. That’s why I usually read over at least three or four recipes before cooking something myself. It’s not that I’m not capable of creativity or improvisation: it’s simply that, not having gone to cooking school or being a truly dedicated home cook, there’s too many things I don’t know, and it seems as bizarre as it would be frankly dumb to dismiss the accumulated wisdom so easily accessible these days via food blogs and websites or even YouTube videos. 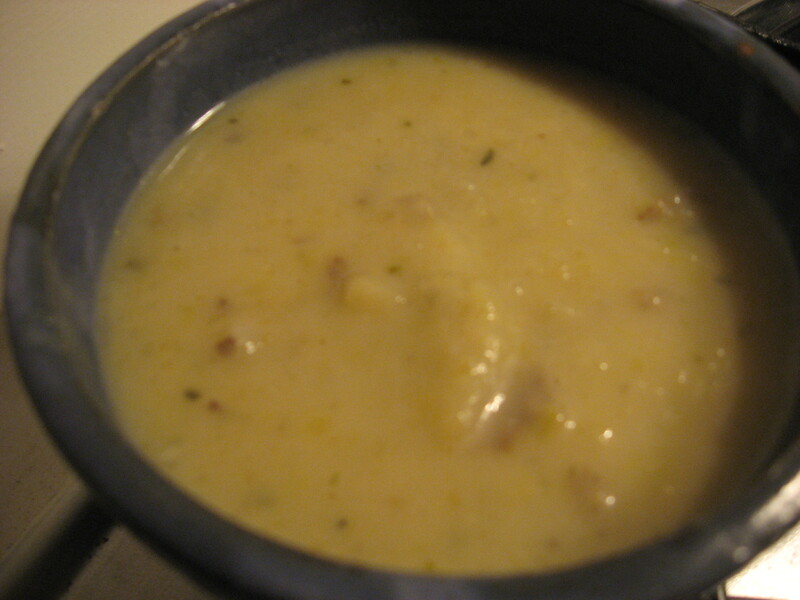 Long story short: I looked up a recipe today for potato leek soup and made it, with some modifications that were in truth very subtle (though not altogether without merit) in terms of overall effect. I used this Food Network recipe from Emeril, though I consider him the biggest charlatan (at least Rachel Ray doesn’t claim to be more than she is) on the network. His line of jarred pasta sauces – all made with tomato paste instead of actual tomatoes, and with inferior oil – offends me, in particular. Whatever, though, the recipe looked fairly standard and easily adaptable. So, what did I change? I’d just read an article on root vegetables in a November issue of The New Yorker and so was itching to incorporate some of the less loved roots veggies of the world. 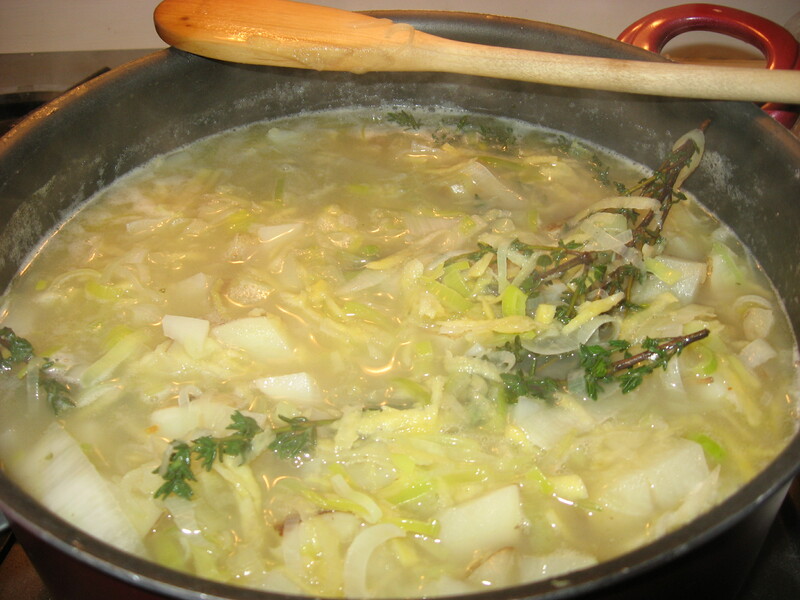 Spurred on to my own rememberances by the author’s description of wisp-light, creamy celeriac soup, I decided to grate this ungainly root into the soup for some complexity of flavor (Idaho/Russet potatoes not being the most nuanced of foodstuffs). 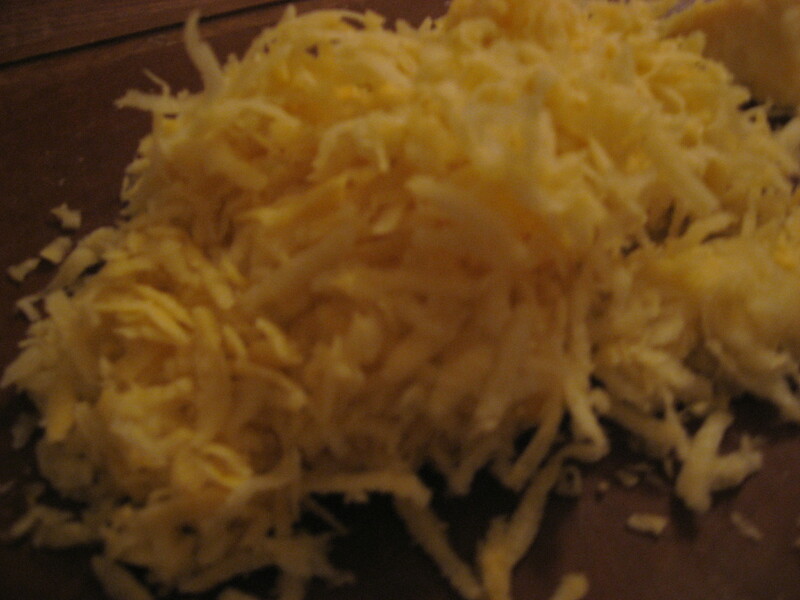 Celery root has an appealing bitterness and looks like one of those filamented, inky horrors illustrated in the Scary Stories to Tell in the Dark books. Also, I added more butter by a TBSP. The recipe called for only two. Two TBSP for a pot of soup? What are we, ascetic monks? Also, instead of going all leek, I figured that shallots make everything better, so added in a few of those into the bubbling butter, pre-leek. Lastly, I used half and half instead of cream. Cream is seriously intense stuff and if you “treat yourself” as much as I do, you just can’t mess around with anything that heavy at home. Going out to eat is one thing, but there’s definitely something to be said for not throwing all caution to the wind.